Rising sophomore AJ Greer and incoming freshmen Jakob Forsbacka-Karlsson and Jordan Greenway were selected in the second round of the NHL draft. Greer was selected by Colorado with the 39th pick, JFK was picked by the Bruins at #45 and Greenway was tabbed by Minnesota with the 50th selection. 2016 recruit John McDermott was not drafted but will be eligible for next June's draft. ► Forsbacka-Karlsson and Greer employed their bilingual skills in media meetings after their respective selections. JFK answered questions for Swedish media while AJ did the same with Quebec-based media. One of the youngest players in college hockey last season, Greer scored three goals and four assists for BU. He worked his way up from the fourth line to the second line and delivered a key goal in the Terriers' win over North Dakota in the Frozen Four semifinal--a one-time blast. The Stockholm native led USHL Omaha in scoring with 53 points, despite missing 10 games. He also earned co-MVP honors at the USHL's Prospect Game. Greenway completed his second year in the USA Hockey NTDP program, along with fellow 2015 recruit Charlie McAvoy, scoring 44 points in 53 games, helping the U18 win the IIHF World U18 gold medal. Online reports indicate that rising senior and undrafted free agent Ahti Oksanen will participate in the New York Rangers development camp. The Finnish wing’s 25 goals last season was second only to Jack Eichel’s 26 for BU and was sixth best in Division 1. Also invited to the Blueshirts' camp is sophomore goalie Connor Lacouvee. 2017 recruit Kole Sherwood has been invited to the Columbus Blue Jackets development camp along with older brother Kiefer, who will play at Miami. The younger Sherwood will spend the next two seasons at USHL Youngstown after scoring 48 points in 31 games for the Ohio Blue Jackets U18s. 2017 recruit Patrick Harper scored a hat trick to lead Team Kelly to an 8-2 win in first day action at the USA Hockey Select 17 tournament in Williamsville, N.Y. The 5'8" center who led Avon Old Farms in scoring with a 20-27-47 line as a sophomore, scored a pair of short-hand goals and one power play goal. Fellow 2017 recruit Hank Crone recorded an assist for Team Red in a 6-2 win. Eric Gryba, hard-hitting blueliner on BU’s 2009 national championship team, has been traded by Ottawa to Edmonton. 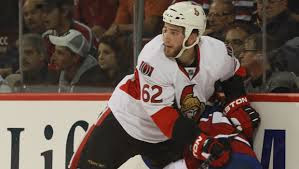 A Saskatoon native, Gryba had completed his third season with Senators, registering 12 assists, 97 penalty minutes and a plus-11. Oilers GM Peter Chiarelli, who previously held the same post for the Bruins, was familiar with Gryba from his college years and playing the same division as the Bruins. 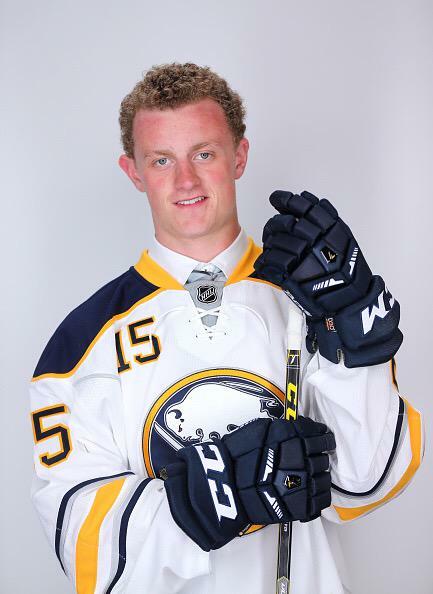 Terrier freshman Jack Eichel, as expected, was drafted by the Buffalo Sabres with the second overall selection of the 2015 NHL Entry Draft. The Hobey Baker Award Winner and Hockey East Player of the Year became the first current college player taken in the top ten since Terrier All-American Colin Wilson was drafted #7 by Nashville in 2008. The only Terrier selected higher was goalie Rick DiPietro, drafted first overall by the Islanders in 2000. With BC’s Noah Hanifin selected #4 and Michigan’s Zach Werenski taken in the eighth spot, it marked the first time in history three current NCAA players were taken in the top 10 of the NHL Draft. Eichel became the 11th BU player selected in the first round. In addition to Wilson and DiPietro, the others were: David Quinn— #13 in 1984; Scott Young—#11 in 1986; Keith Tkachuk—# 19 in 1990; Scott Lachance—#4 in 1991; Jeff Kealty—#22 in 1994; Ryan Whitney—#5 in 2002; Kevin Shattenkirk—#14 in 2007; and Charlie Coyle—#28 in 2010. The NHL Entry Draft resumes today at 10 a.m. with five more rounds of selections. Several current and future Terriers are expected to be picked. Check back later today for the results. While Eichel has not yet revealed whether he will sign immediately with the Sabres or return to BU for a second season, it is widely believed that he’ll decide to begin his pro career. "It feels tremendous," he said. "The feeling of wearing this jersey right now, it really hasn't sunk in. To be able to talk to my family and my friends that are all here about the fact that I was just selected by the Sabres in the NHL Draft, it's a dream come true. It's been the best year of my life. It really caps it off." 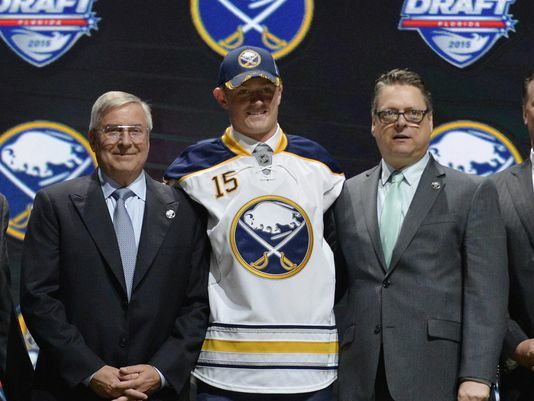 ● ESPN What’s Next for Eichel? 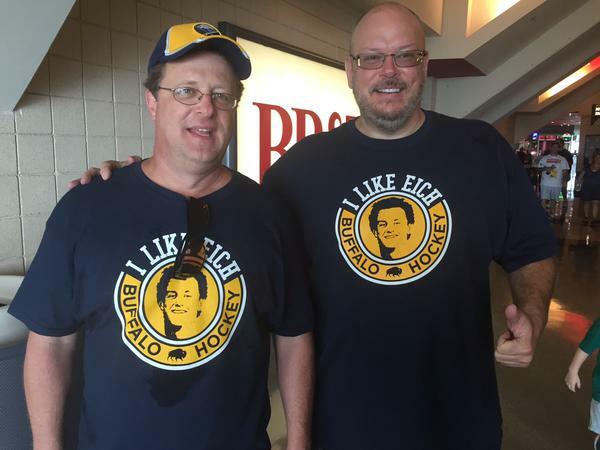 ● Boston Herald: Will Eichel Stay or Go?